Cobook has updated its contacts app on iOS today with a new feature called Livecards, making it easier for users to keep their address book up-to-date and exchange contact information with other people. 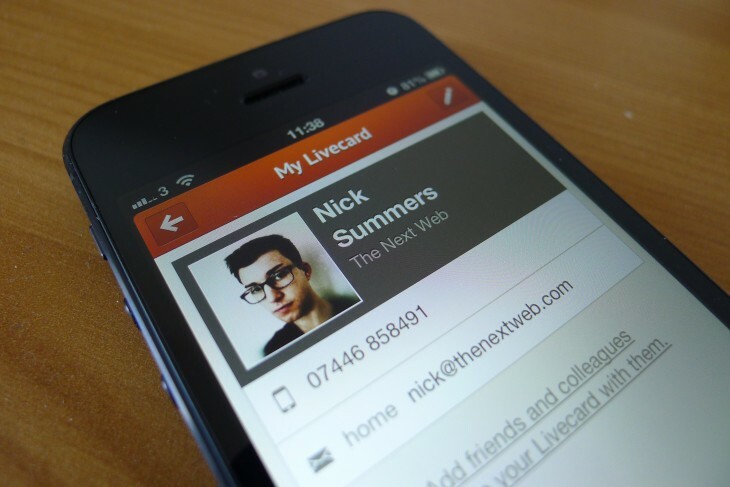 Users will be asked to create a new Livecard after launching the app, which includes only the most basic contact details such as their company name, mobile number and email address. It’s essentially a digital business card, which will automatically update for other Cobook users whenever you add or refresh your personal information. To be able to start sharing your Livecard with other people, Cobook asks that you invite other iPhone users via your Facebook account. It’s a shame you have to bombard your friends with an app invitation in order to use Cobook to its full effect – but admittedly the company has said that email registration is “coming soon”. What’s most impressive is that whenever another user updates their Livecard, it’s updated not only in Cobook, but also the default Contacts app on iOS. It means that even if you dislike the Cobook interface, you can set up a Livecard and still receive most of the benefits using Apple’s pre-installed offering. To see who has shared a Livecard with you, simply swipe from the left and tap the relevant option. It’s worth noting that this feature hasn’t replaced the app’s existing contact information – all the profiles that you’ve stored manually or via LinkedIn, Twitter and Facebook are still accessible by tapping “All Contacts” from the menu. A couple of other companies, such as Cardcloud, have tried to replace physical business cards with a mobile app. None of them have quite managed to build the traction necessary to disrupt the traditional way of exchanging contact information though. Cobook could be the solution. Originally developed for OS X, it’s become a popular way of creating and maintaining a digital address book. The ability to synchronize with Twitter, Facebook and LinkedIn is impressive, but it’s the custom tag features and intuitive navigation that has made it really stand out. On iOS, Cobook is looking to replace the default contacts app with a similar formula. Being able to dial a contact without leaving the app is a nice touch, and the fact that it synchronizes with your existing contacts via iCloud means that there’s very little upkeep involved.